Toronto Game Jam is a FREE, annual, open-to-the-public event where the craziest game makers in the world gather for a 3 day game making binge. Weiss, Webster, Kupferman, Creighton, and Woo explain things best. We're a pressure cooker that strengthens (or destroys) friendships, produces amazing games, and breeds goats. 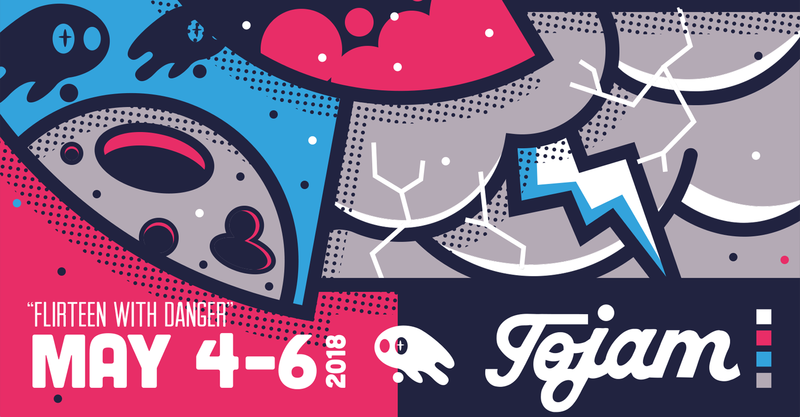 TOJam Flirteen with Danger takes place May 4 - 6, 2018 at George Brown College. Play TOJam13 games here! Race through the ravaged post-apocalyptic wasteland and make friends along the way. Work your colleagues to the bone! Work together with a friend to operate your mech in this 2D action platformer! Destroy all human buildings in sight. Play with a friend locally. Xbox controllers recommended. Love is like summer rain. Torrential and inevitable. You are a snake. You are a waiter. You wait tables. The end. Collect potions- but not too fast! Solve the crime at the shrine. An interactive visual novel. Winning is for losers! The goal of this game is to die. Statistically vending machines kill more often than sharks. Time to disprove it. Lose the Posse or go back to Jail! Dodge and Stack your way to a highscore! Narrative-driven arcade action. and some goofs. Is Winng for Losers or is Winning Everything? Make your way to cat heaven! A short game for TOJam. Explore new worlds! Race through a maze to become King of the Jungle! Don't finish the race, inversely sabotage your opponent to. Air Hockey with Canadian themed power ups. Score on your own net (winners are losers TO Jam 2018). A boss-rush real-time action strategy game where you fight giant goats! You'll need a controller to play this game. Co-op train saving UFO action! TTRS: The game of life. Help Maudelyn make decisions by matching gems. Hurt yourself to hurt your enemy! Flap 'Em Stack 'Em !